America Is The Last Remaining Capitalist Country, Sinking In The West. Gradually At First, Then All At Once. America was conceived in liberty, and an individualistic capitalism was a core component of liberty. Political freedom could not exist without economic freedom. Freed from the yoke of British imperial mercantilism and protectionism, Americans became traders on the global market, farmers and ranchers, manufacturers, engineers, designers, lawyers and doctors, selling their goods and services in response to customer demand, and becoming the greatest creators of improved living standards for everyone on the planet. It was never questioned that the capitalist system was the engine of elevated living standards for all. It was recognized that the human energy that was critical to the system came from individuals with some special combination of ambition, drive, creativity, empathy and grit. Consumers loved the cars and software and healthcare and restaurants and fashionable clothes brought to them by entrepreneurs and conferred their grateful rewards in the form of profits. This system is responsible for unprecedented levels of comfort, health, achievement, peace and personal fulfillment. All other systems are worse. And yet we are sprinting away from it. How does this happen? As Ernest Hemingway wrote in The Sun Also Rises: Gradually, then suddenly. Capitalism gradually becomes corrupted by democracy. Democracy has different goals than capitalism. It demands the political way, whereby an assembly of anti-capitalist special interests can be assembled to create a voting majority dedicated to reaping the benefits of economic confiscation and the redistribution of the product of capitalist enterprise. Capitalism is creative and democracy is restrictive and constraining, accelerating into destructionism as it enters its socialist phase. Here are the phases through which we have progressed in America. Entrepreneurial capitalism is capitalism in its highest and most productive form. Entrepreneurs are alert individuals who observe the ways in which consumers would prefer to improve their lives. They imagine a future in which these improved conditions would be realized, and they assemble the resources and processes and capital required to bring that future into being. Their success is never certain, and they take the risk represented by that uncertainty on their shoulders. When they are successful, the consumer’s life is improved and the entrepreneur makes a profit, perhaps becoming rich. The entire society takes on the dynamic improvement of increasing betterment. Entrepreneurs introduce new processes to make production more efficient, and they harness new technologies for even greater productivity. They do so because the system provides them with the incentives to produce ever improved goods and services at ever lower prices for ever more people. These alert individuals compete with each other to see who can help society the most. More often, they collaborate by forming firms and other structures that make the entrepreneurial process even more productive. In a democracy, at the same time as entrepreneurs are making economic and technological progress to serve more people in better ways, a smaller group of individuals is pursuing a different path: the political path. Their goal is not financial and economic success, but power and control. They see in the achievements of the entrepreneurs an opportunity to finance their path to increasing power. They begin to impose restrictions on the entrepreneurs in the form of regulation and taxation, and they begin to confiscate the gains with which the market has gratefully endowed the creative, productive, innovative entrepreneurs. How can they do this? Because the electorate thoughtlessly granted the political class the right to legislate and regulate. Or perhaps they seized it unilaterally. In any case, it is in their power. And why do they do this? Because the confirmation procedure in democracy is advanced by majority vote. The politicians can assemble a majority of voters by promising them that they can receive the rewards that belong to the entrepreneurs without taking any entrepreneurial risk, and without having to test themselves against the preferences of consumers. They can simply become the beneficiaries of redistribution and confiscation by the political class. At first, the entrepreneurs continue to create, innovate and produce. They tolerate the confiscation of a part of their profits while they are free to keep on earning more. At some point, one entrepreneur or entrepreneurial firm makes the economic calculation that a dollar spent on lobbying or otherwise collaborating with government can generate a higher accounting return than the same dollar spent on more R&D. This calculation turns on whether legislation can result in regulation that protects them against competition (for example, erecting barriers to competition like licensing), or against foreign imports (e.g. tariffs), or gives them a more favorable tax environment than another industry. As soon as the firm makes this calculation, they begin to sidle up to government in order to become a partner in designing laws and regulations and tax systems. The boundary between the economic way and the political way becomes blurred. Profit depends more on serving government than in serving consumers. It is in the largest companies that this trade-off between R&D and lobbying first becomes relevant, because, as a result of their size and concomitant bureaucracy, they are usually less productive than smaller, more creative and more agile companies. They can afford the lobbying costs, and they welcome the protection of government from the never-ending demands of the free market to keep on innovating. These big companies become the crony capitalists. They co-participate with government in industries like aerospace and defense, in computing and cyber security, in healthcare and, most of all, in banking. Their lawyers write the regulations in many cases, for the administrative state to publish, and then the crony capitalists hire more lawyers to supervise compliance with the new laws. Smaller companies wilt under the compliance burden and can no longer compete. Sclerosis sets in. Under government-regulated capitalism, the economic energy is initiated privately and government steps in ex post to tax and regulate. In crony capitalism, the market and the government move to the stage of partnership, where each has an interest in economic growth and there is still some possibility of the consumer benefiting from that growth, albeit in a constrained, contorted fashion. But the government is not satisfied with the partnership. They want to control the economy rather than be a partner in its munificence. 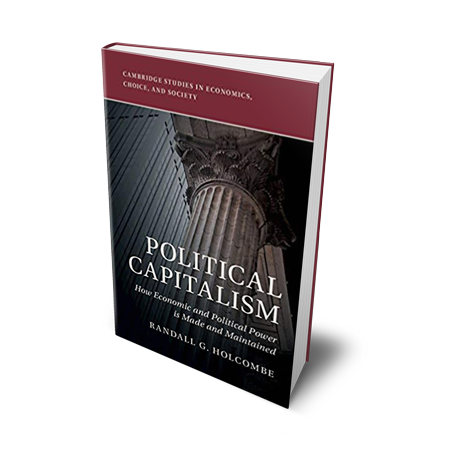 The next stage is Controlled Capitalism, where the elected politicians, the legislature and the administrative state set out in advance the political conditions for what remains of the economic way. … official strategic effort to encourage the development and growth of all or part of the economy, often focused on all or part of the manufacturing sector. The government takes measures “aimed at improving the competitiveness and capabilities of domestic firms and promoting structural transformation.” A country’s infrastructure (including transportation, telecommunications and energy industry) is a major enabler of the wider economy and so often has a key role in Industrial Policy. Note the term “all or part of the economy”. And “promoting structural transformation”. In other words, the government takes the lead, they’re in charge, and the role of the entrepreneurs and private firms is to follow the policy. They are firmly controlled. Democratic socialism is the final stage of the demise of entrepreneurial capitalism. The betterment of the citizens through the creative initiatives of entrepreneurs is no longer the purpose of economic activity. Individuals and firms are no longer the captains of the ships of the economic fleet. The consumer is no longer sovereign in determining what gets produced and what does not. Profit is no longer the market signal of approval for the efforts of entrepreneurs. The word Democratic in the descriptor indicates that this system is political not economic. The word Socialism indicates that the profit signal has been replaced by collectivist goals which eschew profit. For one thing, there is no cost to these goals because the government can print or draw into digital existence as much money as they require to pursue them. Cost is a thing of the past. And the benefits are not economic growth or betterment, but collective goods such as universal welfare (such as the Universal Basic Income), equality of some sort (undefined yet desirable), and global projects such as carbon-free energy. We got here gradually. There were big stair steps along the way: the creation of the Federal Reserve, the New Deal, the Great Society, the War On Drugs, the government bailouts during the Great Recession, and Obama Care. Robert Higgs, in Crisis And Leviathan, called this process “the ratchet”. Each stair step is a ratcheting up of government control, and it never reverses. It just progresses to the next turn of the ratchet. But now comes the All At Once Stage. If we give up on the basic components of the capitalist system – on the rewarding of entrepreneurs for their creativity, imagination and risk-taking, on the economic freedoms that make their creativity possible, and on the profit motive itself – we give up the economic way and submit ourselves 100% to the political way.